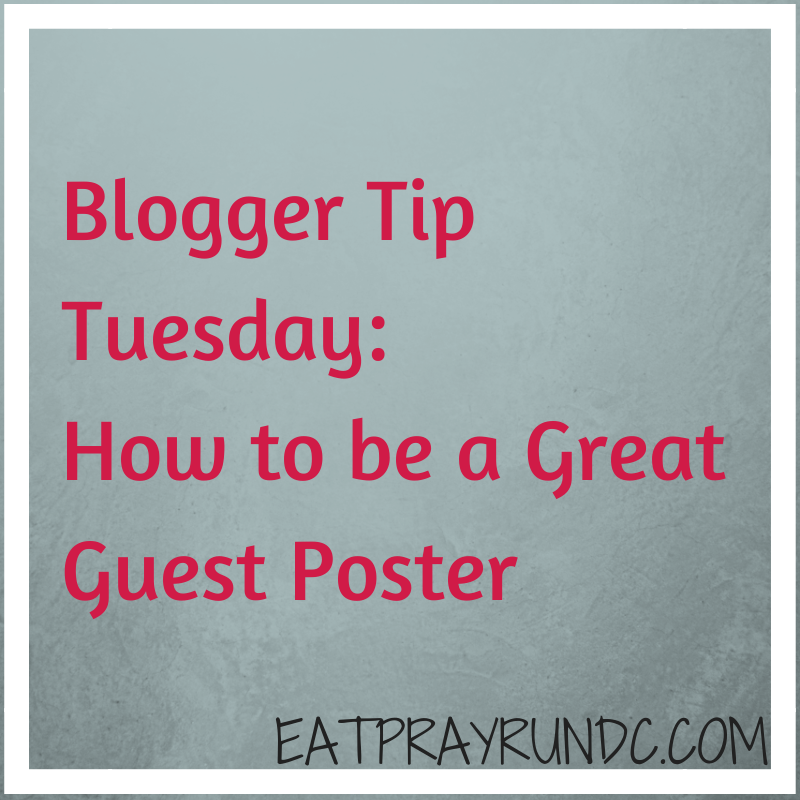 Guest posting is a fun way to introduce yourself to a new audience and to help out a blogger who may need guest posters because they are traveling or they just like to feature new voices. If you have the chance to be a guest poster, you should spend a bit of time thinking about how to be a great guest poster. Write a post that is original and will interest the audience you’re reaching. This is just my personal preference, but I don’t want a guest poster just copying and pasting something from their site — I want my readers to have the chance to read new material. It’s also nice if you put some thought into who you are writing for. SHARE the guest post – I have had a guest poster who didn’t once share the post on their networks or channels. Needless to say, I won’t be asking this particular person to guest post again. If you are taking the time to craft a post, why wouldn’t you want it shared? Make it easy for the blogger you are guesting for — send the post in a word doc, attach pictures, send a short bio. My guest posters did an AWESOME job of this and I appreciated it so much. Reply back to comments that your guest post receives. I loved looking at guest posts and seeing my guest posters engaging with readers. I think this also garnered my guest posters many new readers who were anxious to consider the conversation. If you’d like to guest post again, make sure to stay in touch with the blogger you guest posted for! There are so many ways to connect — facebook, twitter, google+, etc. You should definitely be following them on social media already, but stay connected! You never know — someday you might want them to guest post for you! What tips would you add on being a great guest poster? YES!!! SHARE AND PROMOTE YER GUEST POST TOO!!!! Carla recently posted…The importance of mattering. All great tips, Courtney! One tip I might add is to not only promote the guest post your Social Media channels, but also to mention it on your blog, and link to the guest post on the blog you contributed to. It all means more networking for both you, the guest blogger, and the blogger who allowed you to guest post for them. Great tips!! I always want to guest post but have such a hard time thinking about a topic LOL! Preshii @ The Coily Bombshell recently posted…Top 5 Fitness & Health APPS!! Awww definitely would love too!! I’ll start thinking of something o_O! Do you think you could possibly do one for me too? I am going to Europe for the month of June. I wouldn’t need the post until end of May but no pressure – you have a wedding and i’m sure it’s crazy thinking how close it is! awesome — and yes, i’d love to! Love this! So true. I always try to engage with commenters- how can you expect the person who didn’t write the post to answer questions? Hey Courtney GREAT post! I’m fairly new to blogging. Any suggestions on ‘how’ to find the opportunities to guest post more often? I’ve reached out to various bloggers asking about guest posting but usually they don’t respond or it’s a no thanks lol – Am I doing something wrong? hi sean! i just responded to you on twitter, but my response is basically what you’re already doing. i would suggest searching within any online blogging communities you are active in. for example, i posted in a facebook group that i’m in that i was looking for guest posters and got a few that way. the converse also works — i.e. people looking for the opportunity to guest post also post and usually get a good number of responses! I would love to write a guest post for a blogger…thanks for these tips! Does a guest provide their own ideas on what to write or is it usually suggested by the host blog? Do you just ask to write a guest post or does the blogger usually request one? hi janelle — i’ve seen it done both ways. it just depends on the blogger. personally, i allow my guest posters to suggest a topic and then we go from there! as far as how guest posts are procured, it also works both ways. i’ve written here on the blog before to solicit for them and i’ve also asked friends who blog! Mar @ Mar on the Run! recently posted…Two Weeks to Pittsburgh!! Great information, thank you for sharing :). Have a wonderful weekend! Ah, sharing and replying to comments when you guest post, super important! I agree many guest bloggers forget to do so because the post is not in their blog 🙂 Your tips are great! Delia @ Blog Formatting recently posted…Ultimate Blog Challenge: Checked and Top 10 posts, and help for you! Thanks Delia — I think it’s something that’s really easy to forget but does make a difference!